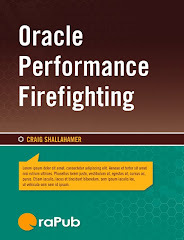 Oracle Database performance tuning and analysis has come a long way in the last 20 years. First there was the “just add more resources” approach and tuning the blatantly poor SQL. Then there was ratio analysis, followed by wait event analysis, time based analysis, and unit of work time based analysis. In addition to the performance diagnosis and analysis evolution, the Oracle Database as a product has changed, and architectures are more diverse. Yet with all this change, some things are in many ways timeless. They relate to complexity, basic mathematical statistics, efficiency, and doctrinal purity. Over the next few weeks, I'll post four different "myths." I have recently posted about complexity (better tools) and basic mathematical statistics (average SQL elapsed times). This posting centers on a cloud vendor's desire for efficiency. The third myth is Infrastructure-as-a-Service (think: cloud) vendors want efficient systems. Fact: A cloud vendor generates revenue when they charge you for CPU cycles, I/O operations, IO space or network activity. Therefore, cloud vendors who charge you for computing resources want you to consume more CPU cycles, perform more I/O operations, consume more disk space, and send/receive more network packets. If that doesn’t convince you, think about the marketing messages promising that all the computing resources you will ever need will be easily available. The solution to “buy more hardware” has become very, very easy. There are no additional contracts; no one to call to install more hardware; no approvals, purchase orders, or approval chain of command; and on and on. This is a vendor’s dream! The message here is “Eat more and be happy, for tomorrow we die,” not “Eat healthy and prosper” (or something like that). This is yet another reason to get good—very good—at quantitative Oracle performance analysis! We need to understand that it’s now very easy to acquire more computing capacity, so the pressure and priority to optimize can be allowed to decrease ... but tomorrow we die. Focus on the ability to quantify our performance work monetarily, and the priorities will more likely align properly.